1) Do not try to demo two games at once. That table over there on the right looks great with both games set up. But it almost broke me. Trying to run two different games at once was a bad idea. I did not want to turn away a potential playtester because the game they wanted to play was in a box instead of on the table. Instead what happened is that when both games were going at once, I was able to pay less attention to how things worked or didn't work or just help people through the first couple of turns. Thank god a good friend of mine hung out for most of it or it would also have been a lot more tiring then it was. On day two, I put out Spore Wars till lunch got three great plays in. Then switched to UFO Racing League after lunch. I was able to pay much closer attention to what was happening in the plays and help guide people as needed. 2) People who come to a convention to play unpublished games are smart people and friendly. 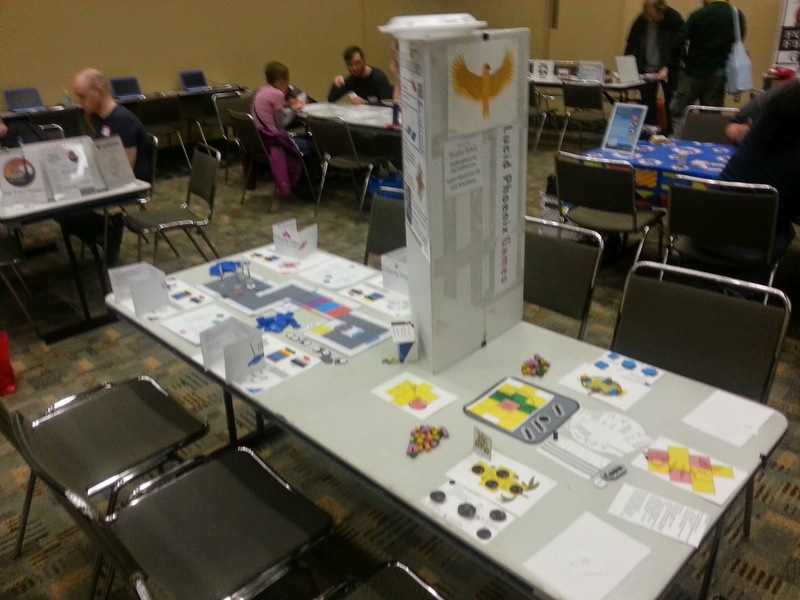 More then once, I had a play tester ask after the game what my plan or steps toward publication would be. That was not a question I expected and one that shows a level of knowledge and sophistication about game development. But maybe I should have expected that from these attendees. Also, these people are hear to play games, They want to play games. I don't think I once asked someone if they wanted to play a game and they said no. So if you go to something like this, don't wait for them to ask you to play -- ask them to play. 3) The pylon was useful. People came over and read what was on the pylon as they walked by. That was probably the best thing about the pylon. It gave people who may not have wanted to ask me something or interrupt a way to find out what I was showing and figure out if it was something they would be interested in. 4) Business cards are a must have. Put all the ways for people to follow you on it. If they like your game, they want to know what happens to it and so they need to know how to follow you on Twitter or Facebook or your Blog or whatever you have. So put it on a card and hand it out when people express interest. 5) Don't worry if you do not have a sell sheet. I don't think anyone took one and no one asked for one. I heard lots of noise about sell sheets before the convention. I built one for UFO Racing League because I think the game is pretty mature in the development process and I had them sitting out all day 2 (forgot about them day 1). I did not build one for Spore Wars because that game is officially about a month old. Now this is clearly a small sample size and I'll be interested to hear if others had different reactions, but I think I'm undecided on sell sheets.